When ePayments are enabled in your database, Jackrabbit defaults to allow you to maintain up to three credit cards on file for each family. 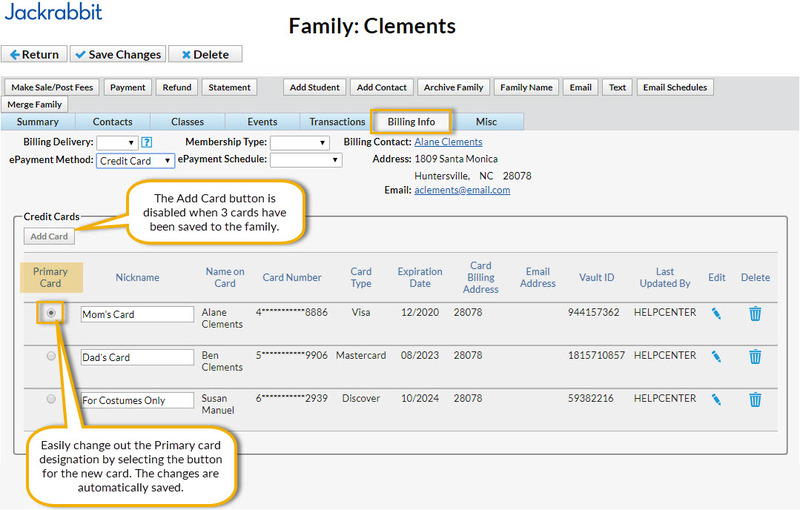 If you prefer to only allow for one credit card in each Family record you will need to update your ePayment settings (see Accepted Credit Cards & Multiple Cards on Family). The first credit card added to the Family record is designated as the Primary Card. When subsequent cards are added, the Primary Card can be changed. The card that is marked as the Primary Card is considered the family's main credit card on file. The Primary Card is used when you process ePayments in batches using Transactions > Process Credit Cards/Bank Accts. If a family wants to use a card other than their Primary Card for a recurring payment (Transactions > Process Credit Cards/Bank Accts) the Primary Card selection must be changed and saved first. This can be done by a Jackrabbit user on the family’s Billing Info tab or (if you allow it) by the family themselves using the Parent Portal. Jackrabbit defaults to the Primary Card when the Use Card/Acct on File button is selected, however it is possible to select a secondary card on file in the Post ePayment window.